View Drosophila data. 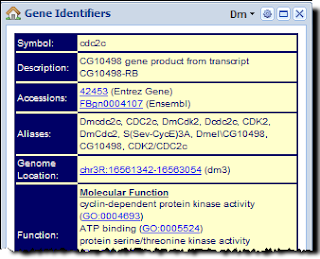 As shown in the figure at right, you now can view Drosophila data in our “Gene Identifiers” plugin. These identifiers (including Entrez Gene, Ensembl, Refseq, Uniprot, etc.) and annotations (including Gene Ontology, Interpro, genome location) are harvested from public databases. Search for Drosophila genes. You now can use Flybase identifiers as search queries in BioGPS (e.g., FBgn0004107). Note however that currently, BiopGPS defaults to human data, then mouse, then rat, and then finally drosophila. 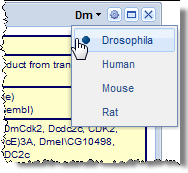 To see drosophila data after executing a search, you will need to use the organism selector. Use and register Drosophila plugins. We currently have seven Drosophila plugins in the plugin library. These include plugins from the well-known FlyBase database (plugin), and lesser-known databases like FlyExpress (plugin) and FlyMine (plugin).